Kellie is a pretty cool girl and I loved getting to hear the story from her point of view. She's a loving sister, a pretty good friend, a responsible daughter and a fairly decent student. She's pretty level-headed and kind of rolls with the punches, too. Another bonus, she loves old music. Specifically 60's music. I say, heck yes! Her relationship with her Mum was really nice to see. They are really close and you can tell how much they love one another. They're also a fair amount alike. I also love just how much Kellie adores her little brother - he's so stinking cute! Kellie might not totally get along with or understand her father, but she still loves him and wants his approval. It was also nice to see a sister relationship be portrayed so well. It hurt my heart when her sister started to pull away, but once things get explained, it made me feel a little better. I still don't think her sister handled it well, but I can understand why she acted the way she did. I also love that the author portrayed a step-parent in a positive light. Kellie and her step-dad get along pretty dang well, which was most refreshing to see. I simply love how the family plays a big role in this novel. In essence, I think this novel is about family. You can love them to bits or want to rip your hair out with how annoying they are, but they're family. I loved how, though they're definitely far from perfect, Kellie's family is also very real. Again, this book is so realistic! One little story bit I thought was unnecessary was the fallout between Kellie and her best friend, Kaitlyn. One minute they're best buds and the next, her friend wants absolutely nothing to do with her. Then again, I kind of had the same experience. I had a friend, just like Kellie, who I grew up with, but one day didn't want to have anything to do with me because I wasn't popular and didn't care to be. I've never been one to chase popularity, so this sudden distancing really stung. We became friends again later, but we were (and are) still not even half as close as we used to be. It's sad, but then again, that's growing up, right? People learn and experience and change and sometimes grow apart. It's sad when it happens, but that's just how things are. As a plot device, I'm not so sure it was needed. Then again, as I'm typing this, I realize it does make it just one more thing for our poor, already overwhelmed Kellie to have to deal with. Speaking of relationships, I'm still on the fence about the love interest, Oliver. For one, he's already in college. For another, they had a near sexual interaction the first time they ever met. Then he comes back into her life and they almost pick up where they left off, being all intense and stuff? I don't know. Maybe it's because I never had a teenage love, but I just didn't buy it. Their relationship never sat well with me. Oliver, as stated before, is a really intense guy. I sometimes worried that he might have something wrong with him and I worried for the safety of our girl, Kellie! Some things are explained later, but I'm still not quite satisfied. So much happens to her! I remember thinking that there's only so much one person can take on before they explode. Thankfully, Kellie has a much more solid head on her shoulder than most. I was really glad when Kellie started to discover herself and what she's good at a bit more after joining the school newspaper. For a student who just kind of wants to skate by unnoticed, without much fuss, it was really good to see her start to participate. I know, I probably sound so old by saying that, but still. I remember wanting to find my place at about the same age, so I could definitely relate to that as well. I liked her newspaper friends a lot. They're all really quirky and driven and I think they're a good influence on Kellie, for the most part. Again, they all have their flaws, but they're quite decent kids. And realistic... can't forget that. 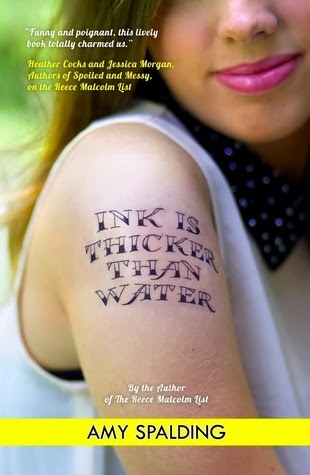 Overall, I am so happy I was able to add Ink is Thicker Than Water to the list of amazing books I've read this year. I feel as though it might have been a little rushed at the end, but it's still a pretty dang solid story. 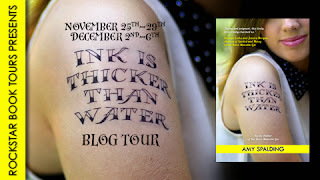 This is my first Amy Spalding novel, but it's definitely not going to be the last. If you're looking for a heartwarming, realistic coming-of-age story with a great focus on family relationships, I highly recommend this book. Give it a shot. You won't regret it. And just because I think it would be fun to share - and I'm a sucker for music anyway - here's Kellie's favorite song, Bus Stop by The Hollies! Happy listening! Amy Spalding grew up in St. Louis, but now lives in the better weather of Los Angeles. She received a B.A. in Advertising & Marketing Communications from Webster University, and currently works as the Digital Media Planner for an independent film advertising agency. 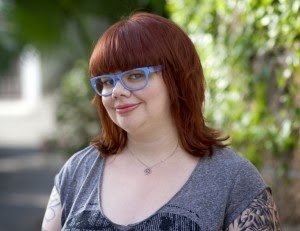 Amy studied longform improv at the Upright Citizens Brigade Theatre, and can be seen performing around L.A. Thanks for the giveaway and good luck to everyone. But of course! Thanks for entering! I have another good friend named Amy Spalding. This book is really good! Definitely give it a shot if you get the chance.